Since 2012, Google has supported the study and publication of broadband pricing for researchers, policymakers and the private sector to better understand the landscape and to help consumers make smarter choices about broadband access. We released the first dataset in August 2012, then refreshed the data in May 2013 and March 2014. Today we’re releasing the latest dataset, a result of our fourth iteration of the study. The mobile dataset covers 3,305 plans in 112 countries. The fixed dataset covers 1,983 plans in 105 countries. We believe in the power of open data. We want this study to be useful for regulators, academics and policymakers to understand the state of internet access and make data-driven decisions. We plan to continue to sponsor this work in the future so we can identify trends in the space and we’d love to collaborate with other organizations who are interested in getting involved in this study. We would also like to hear how you are using this data. If you are interested, please contact us at broadband-study@google.com. Why aren't there more Monkeybrains? Monkeybrains is a wireless Internet access provider in San Francisco. Created in 1998, it’s not a big company—it’s a small business founded by two friendly engineers and run by a handful of people. Until recently, they only offered broadband speeds similar to old copper telephone networks. 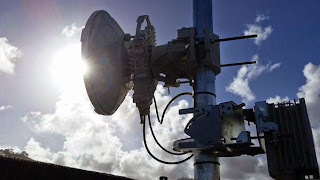 But they’ve started rolling out an ultrafast 300 Mbps service, buoyed by a successful crowdfunding campaign that raised nearly half a million dollars and the declining cost of antenna equipment. In the U.S. broadband market, this sort of development is particularly intriguing. Today, nearly 75% of the country has no choice in broadband providers; at best, most consumers only have two options. Even if the market of available service providers does not grow significantly, the market becoming more contestable—meaning an increased potential for new entrants—could be a significant development. That would make existing Internet service providers much more concerned about customer satisfaction—and that’s good for consumers. Spectrum reform: ultrafast wireless services would be much easier to deploy if there was more spectrum available for both exclusive and shared use. Access to video programming: most consumers expect to buy a TV package with their Internet access, but it is difficult for new entrants to license broadcast and cable TV channels at competitive prices. Rights of way, siting for the equipment, and permitting processes: cities could make it easier to put up wireless equipment in public rights of way. This of course needs to be balanced against a range of factors—including a desire to not have a city cluttered with lots of wireless equipment. Earlier this week, Leviathan Security Group released three white papers that explore cybersecurity in cloud computing versus local storage. Each paper examines a different aspect of security and storage, including availability, cost, and talent acquisition. In general, Leviathan finds that cloud solutions are generally more secure, resilient, and redundant than local equivalents. Cloud services provide much better resiliency and redundancy than local services in the face of disasters of all sizes—from small transformer explosions that affect 30,000 users to superstorms the size of Thaiphoon Haiyan. This means quicker data recovery and the ability to keep communications infrastructure like email up and running, which is essential in a post-disaster environment. Even with increasing emphasis on STEM education and growth of computer science programs, organizations—private and public—will not be able to acquire all of the talent necessary to satisfy the demands of local storage infrastructure. For example, there are currently over a million open security positions worldwide, but beginning in 2017, all of the GCHQ-led cybersecurity programs together will graduate just 66 PhD's per year. Of note for numbers lovers, the paper titled “Value of Cloud Security: Vulnerability” lays out a thorough analysis of storage needs for companies of different sizes and compares cost of cloud versus local storage solutions. They find that cloud solutions are cheaper for small organizations in the near term and provide better security because of the expertise, which is concentrated in large organizations. So what do these findings mean from a public policy point of view? Many countries, including Brazil and Russia, have proposed laws requiring that companies keep the data of that country’s users within national borders. This idea, known as “data localization,” purports to keep citizen users safer and out of the hands of spying governments and hackers. However, forced data localization prevents companies, governments, and organizations from realizing many of the benefits afforded by cloud services. For example, if a local data center is impacted by a natural disaster, that data is not replicated elsewhere and thus is lost. And given the shortage of security expertise, there’s simply no way that every organization’s security infrastructure for locally stored data can keep up with the state of the art. Finally, preventing small enterprises like startups from using cloud services means that they must take on additional costs in terms of talent and infrastructure, and will likely end up with systems that are less secure than what cloud infrastructure would provide. In the end, data localization reduces opportunities, results in weaker security, and, in some instances, compromises the availability of data. To learn more about data localization proposals around the world, check out Anupam Chander's paper, "Breaking the Web: Data Localization vs. the Global Internet."